Ok, I'm the guy in the "too much" hat for today... A question that I found to be - despite its correct looks - without effort made me ask for details. I admit it was not in a nice tone, that's clear. My case is clear: I should have been nicer (thanks @PetterFriberg for the nudge to cool down). How to act if someone behaves this way? Thanks for all the suggestions. +1 question: as my comments are just litter on the question, should I remove them? I think the tone of your responses is a secondary problem, and that the main problem is that the type of exchange you were participating in is outside the intended use of comments. Comments should be used by potential answerers to request additional information that could improve the question, and by the OP to respond with that information, unless they can be guided to edit it into their question instead. If you ask for more information and the OP is recalcitrant, you're done. If they respond with belligerent comments, they're misusing the comment system and their comments should be flagged for deletion. Responding to them at that point, even if you're extremely polite, will never do anything but make the situation worse. Your comments will be just as off-topic as theirs are, even if you're extremely polite, as it's already become obvious you're never going to be able to get them to help improve their question. I get that it's tempting to respond when someone says some stupid thing to you, but I think the best way to deal with that temptation is to train yourself to be more satisfied by calmly pushing a button and watching the stupid thing they said get deleted. Imagine how cool it would be if that worked in person. I'm sorry, now reviewing the question, I see that the english in the question is lame. I was composing it about 5 hours, and at the end, have overshortened it, and thus, it became unclear :-( I just wanted any info on those dmn characters, and the link on regex101 was just for covenience as alternative to inline snippet. But I'm not here for free rides, and don't need anyone to write code for me. I didn't need it 20 yrs ago when've written my first one, it's just not interesting. Your profile looks like you're freebie-lovers-hunter, so I was offended. I did unprofessional, and it's a shame, especially when the question turned out really bad (-10 at the moment of writing). Sorry, @ppeterka and everyone involved! I promise to be more open to critics the next time, and put additional effort to fill gaps in my english. Just noticed many downvotes on all my questions. Could this happen because of the conflict? I want to account only trusted downvotes, to know for sure that I understand good question criterias correctly. 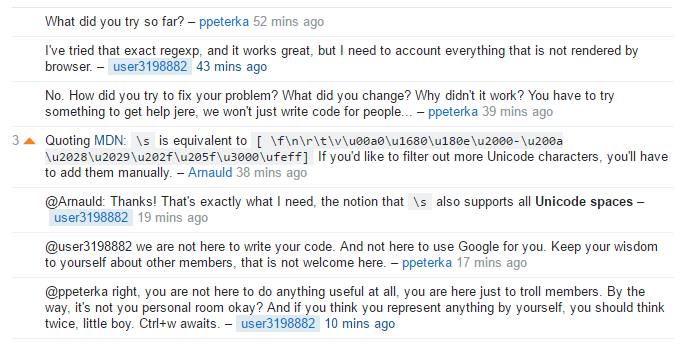 Reading @ppeterka explanation, and other people's answers and comments, it's obvious, that he wanted and could help me, it wasn't an offense at all. But could be taken as offense. I also could take it professional and just compose more and more details. He did more than just downvote, he have tried to help even with this. I've chosen to argue, because of my negative thinking :-(. That's double shame. I've just had to stay professional. Anyway, I'll improve those question, because it's a shame either, how unclear it is. My own thoughts - not necessarily directed towards your heated exchange, but how I feel about interactions between IT professionals in general. People advocating their advice or point of view generally win a lot more friends when they drop the holier-than-thou approach. It's simple human nature. In general people dig their heels in when they are being derided someone who is sanctimonious and patronising. This is true in any workplace - Jim Coplien with whom I did my Scrum / Agile training was unequivocal about this ("remember - you SACK the a****** super-developer".). After a while these self-absorbed superstars eventually realise that they are just Comic Book Guy from the Simpsons. Seriously, who in the "normal" world wants to be associated with such people? I have to say, I think your tone was largely the problem here. Although everything you said was completely valid, this could have been avoided if you had worded it differently. Basically I think although you were right to ask for more details, the part where you said "you have to try something, we don't just write code for people" was completely unnecessary and exactly the passive aggressiveness we should aim to get rid of on this site. It added nothing of value to the comment at all and you just assume the OP hasn't really given anything a go before asking the question. The comments were not deleted by OP most likely, but deleted by rude flags, instead. Under certain circumstances based on comment content, even 1 rude flag can suffice to delete a comment. As to your responses, you were getting a little heated there. While most of your comments are unobjectionable, it is better to not engage with OP's who get rude or take things personal. Simply flag the offending comments appropiately, and remain focused on the topic. If they make a habit of it, a mod will deal with them sooner rather than later. Not the answer you're looking for? Browse other questions tagged discussion comments specific-question deleted-comments behavior . 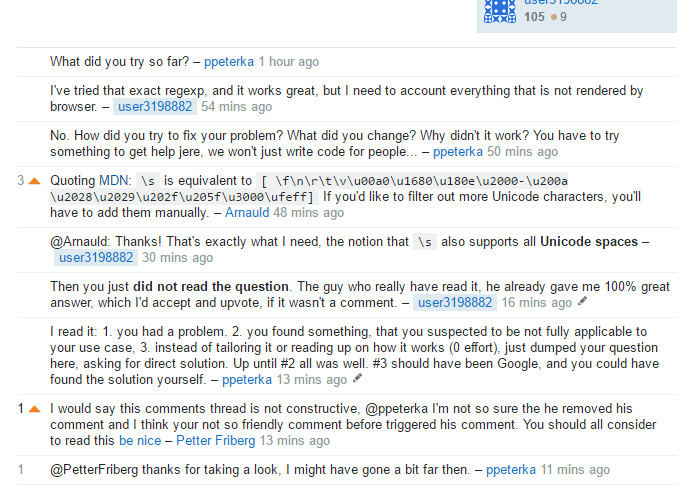 Why was my comment telling a user to learn how to debug removed? How on earth did I fail this test?